omino71 @ essentiallyrome, a photo by OMINO71 on Flickr. Altough, the street art is a global phenomenon, that is making the suburbs all over the world equally colorful, in Rome the modern street art it’s not able to leave aside Rome itself. A place where a quarter of all the artistic beauty of the world is concentrated, a city three thousands years old where an energy buried makes you daily living, is still a strong source of art inspiration. 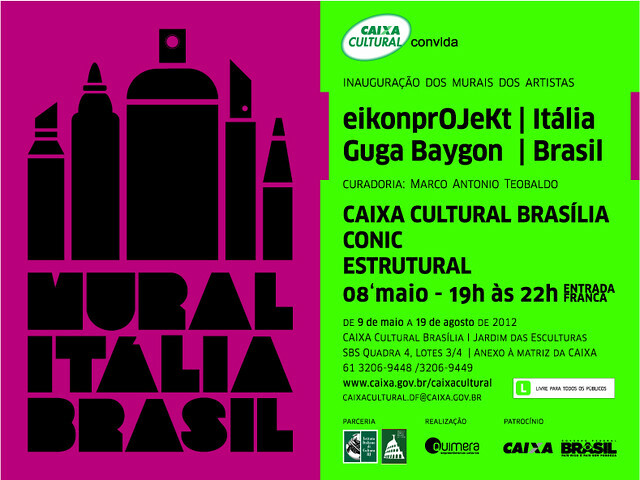 In Rome art never dies, but is transformed, changes appearance, style, color, but it always aims to spread the beauty. 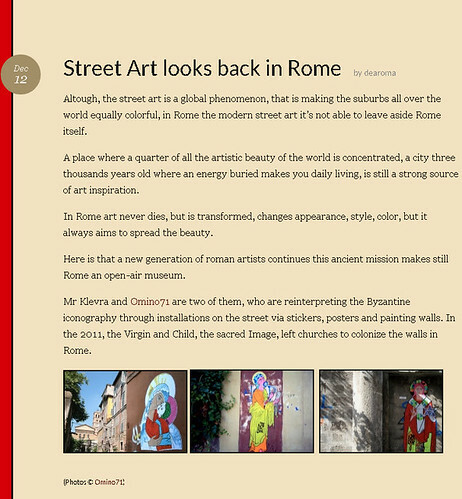 Here is that a new generation of roman artists continues this ancient mission makes still Rome an open-air museum. 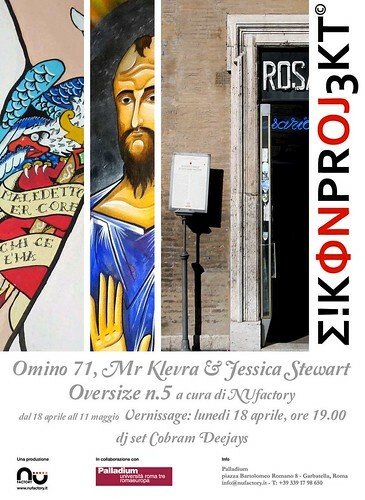 Mr Klevra and Omino71 are two of them, who are reinterpreting the Byzantine iconography through installations on the street via stickers, posters and painting walls. In the 2011, the Virgin and Child, the sacred Image, left churches to colonize the walls in Rome. Although it may seem a profane action, actually these works, so full of religious meaning, leaning on peeling walls, are expression of a new idea of sacred that looks back at the Man. 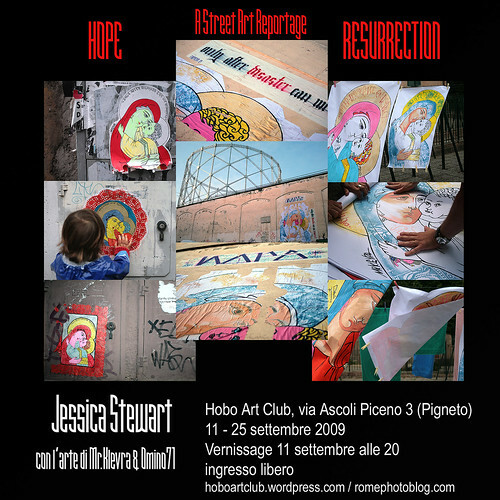 Two other great roman artists are Sten & Lex , considered two of the most famous street artists in Europe, first in the world to introduce the half shade technique that they have nicknamed “Hole School” consists of stencils with many holes of different sizes that all together provide a highly photographic image. One of their most famous work has been a 26×12 m poster on the entire front of a building created in Rome in the Garbatella district, maybe the most lively area in Rome for the new trends. The Poster shows a Wolf, the mithologic symbol of Rome, and Francesco Totti, maybe the AS Roma’s greatest football player ever, a modern icon of the being romans, of the “Romanità”.